Jambalaya! 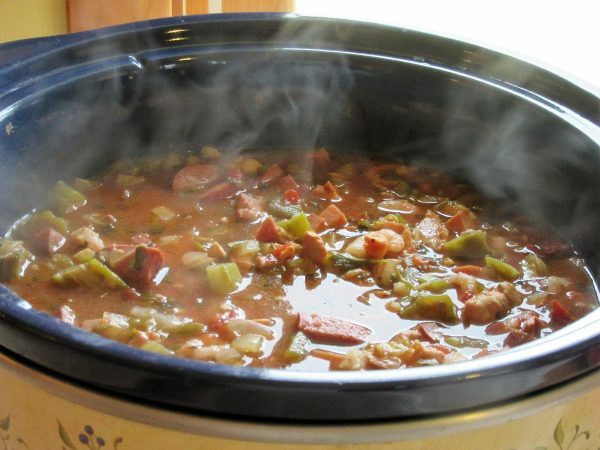 That scrumptious, bursting with flavor, kicked up with some heat, Louisiana Cajun stew that is just so soul satisfying. 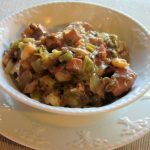 Jambalaya always contains smoked ham and some sausage, usually spicy Andouille, but since that is pretty near impossible to find in these parts I substituted a smoked beef sausage with real wonderful results. Other meats and seafood can vary depending on your tastes and what’s available. I used chicken and shrimp, but quail, crab, dove or crayfish are also popular choices. I added Okra because I love it, but not all recipes use it. Whatever you do, use as much cayenne and Tabasco Sauce as you can stand because that truly adds a layer of flavor that makes it Cajun. I am a wimp when it comes to heat, but Dan loves the burn so we always need to compromise. 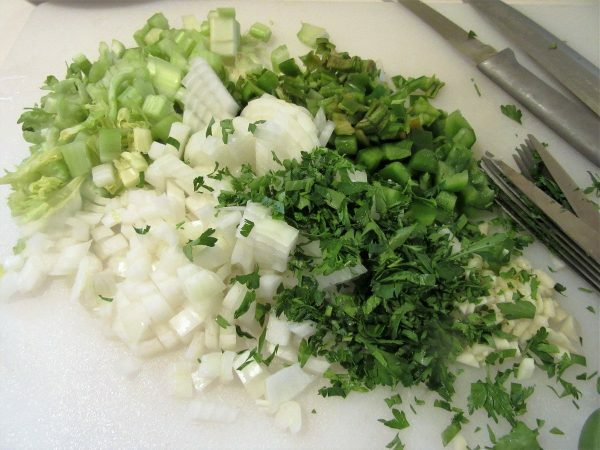 Lots of herbs and aromatics give this dish a depth of flavor that can’t be beat. 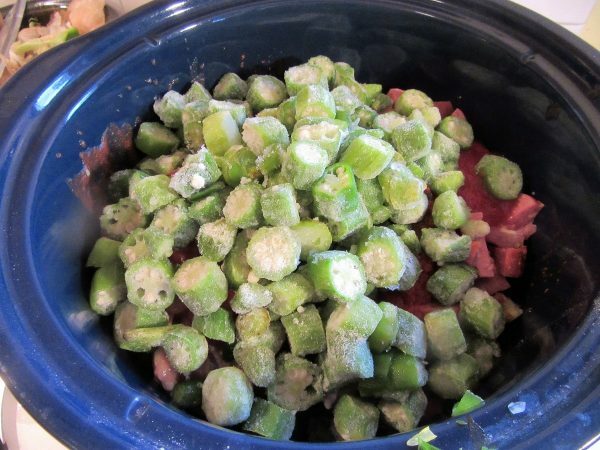 There is a fair amount of prep work involved getting all the vegetables and meat cut up, but once that is done, the slow cooker takes over and you can just walk away and come back 9-10 hours later to a meal that is beyond delicious! You can even do all the prep the night before and in the morning toss it together just before you leave your house for the day. Traditionally served spooned over a bowl of rice, this one is a crowd pleaser for sure! 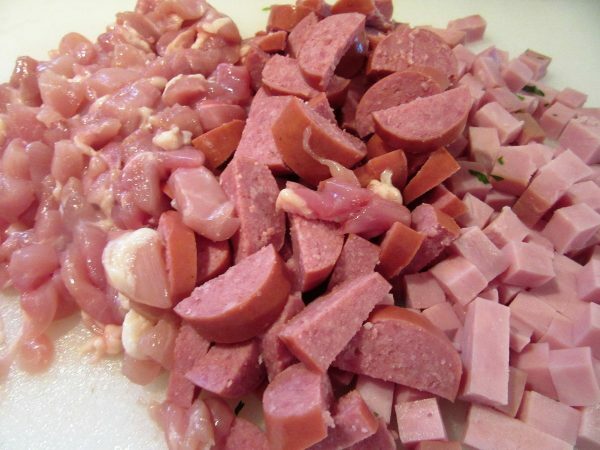 Let’s go build us some Jambalaya! 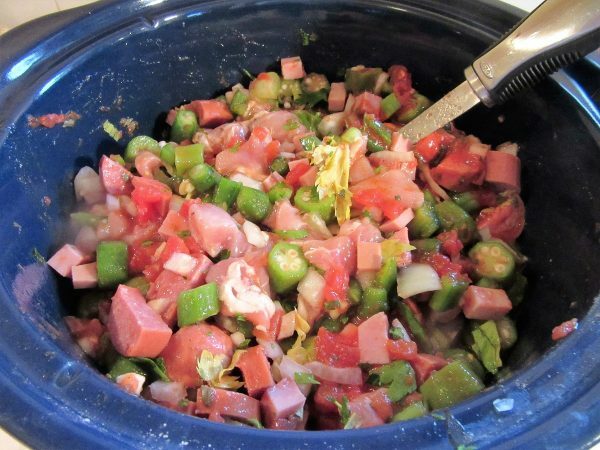 Peppers, Onions, Celery, Garlic and lots of Herbs give this Jambalaya its mouth watering aroma and Character. 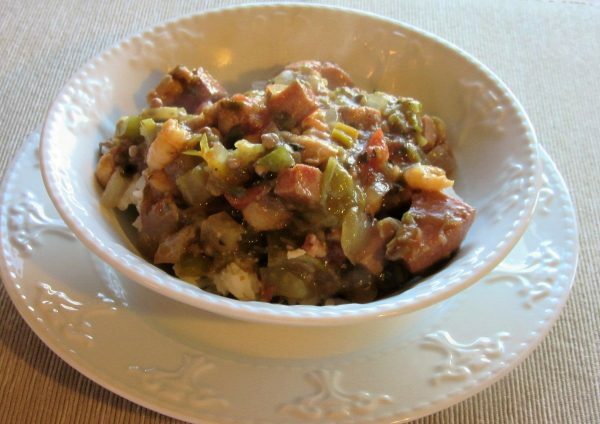 The combination of Ham, Chicken, Sausage and Shrimp not only season the stew, but absorb the other seasonings making each bite a delight! 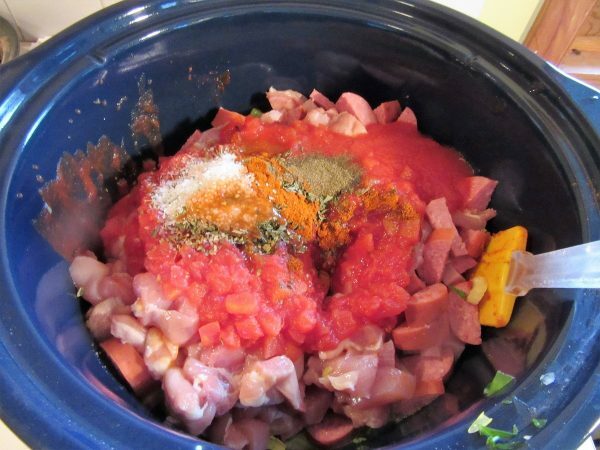 Add the diced Tomatoes, the Tomato Sauce and Chicken Stock to the Slow Cooker along with all the seasonings. Parsley, Basil. Oregano, Paprika, Salt, Pepper, Tabasco and Cayenne if using. Top with the frozen Okra. Give it all a good stir. Put the lid on the Slow Cooker. Plug it in. Turn it on "LOW" and walk away. Your work here is done! Come back in 9-10 hours, add the Shrimp and give it a stir. Let the Shrimp warm through. Cook some Rice and you are done! 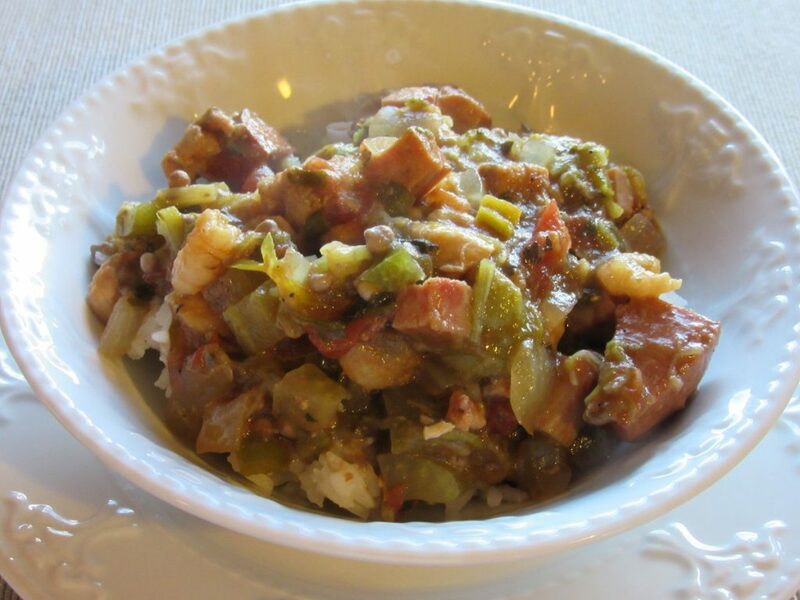 To serve the Jambalaya, place about 1/2 Cup of cooked Rice in a bowl and top with a generous portion of Jambalaya. Get ready to enjoy a delicious treat! Perfect for all those Fall Football Games. I think that like most stews, this tastes even better the next day...if that's possible! Thanks so much for stopping by today! Autumn is just days away and I hope this season finds you blessed to share a spicy, warm meal with family and friends! Okay….I don’t see the print button again. Sigh! No worries. Do you see where the recipe ingredient list actually starts and there is a small picture of the Jambalaya in the left hand corner? To the right of the picture is a small image of a Printer. Just click on it and away you go! Of course. Right in front of my nose!!! Thanks!